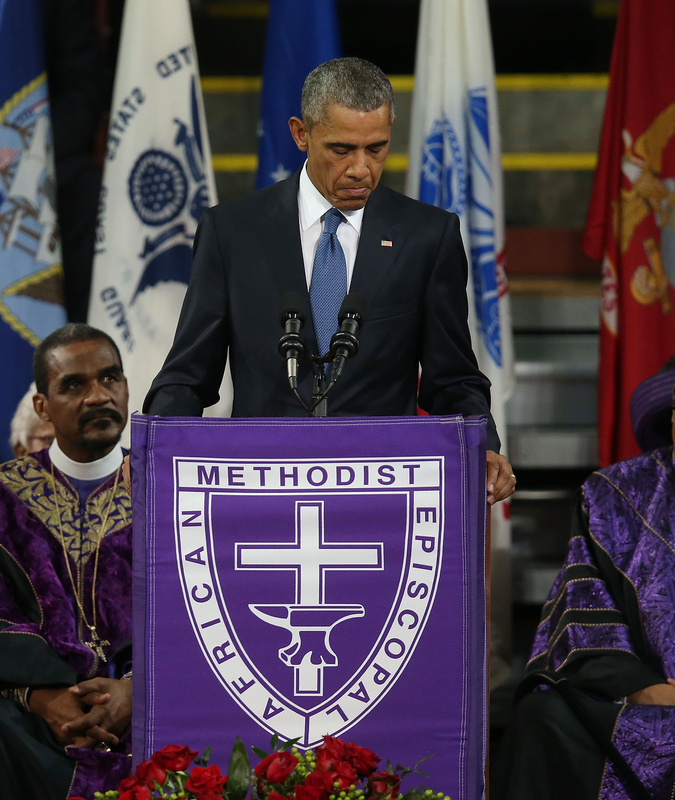 On Friday, President Obama stood in front of a throng of mourners in Charleston, South Carolina, delivering the eulogy for slain state senator, Rev. Clement Pinckney. The 41-year-old Pinckney was one of nine people killed in the now-infamous shooting at Charleston's Emanuel AME Church on June 17, with his death prompting an outpouring of grief, remembrance, and faith. And all three of those were on full display during his funeral services. You should read the transcript of President Obama's moving eulogy, because it's rare to see a commander-in-chief speak so emotionally in public. The nine people slain in the Charleston attack — allegedly carried out by 21-year-old named Dylann Roof — were specifically cited by name in Obama's remarks, after a seemingly spontaneous moment in which he broke out into the iconic hymn "Amazing Grace." The full video of the eulogy is definitely worth the watch, as well, but in reading the speech through you get a different sense of its power, moral force, and conviction. The full transcript is below, as posted by the White House on Friday. Simply put, people could someday look back on the shooting and this eulogy as a moment of deep significance in American history, so it's important to make sure it's well-cataloged. I cannot claim to have the good fortune to know Reverend Pinckney well. But I did have the pleasure of knowing him and meeting him here in South Carolina, back when we were both a little bit younger. (Laughter.) Back when I didn’t have visible grey hair. (Laughter.) The first thing I noticed was his graciousness, his smile, his reassuring baritone, his deceptive sense of humor -- all qualities that helped him wear so effortlessly a heavy burden of expectation. He embodied the idea that our Christian faith demands deeds and not just words; that the “sweet hour of prayer” actually lasts the whole week long -- (applause) -- that to put our faith in action is more than individual salvation, it's about our collective salvation; that to feed the hungry and clothe the naked and house the homeless is not just a call for isolated charity but the imperative of a just society. To the families of the fallen, the nation shares in your grief. Our pain cuts that much deeper because it happened in a church. The church is and always has been the center of African-American life -- (applause) -- a place to call our own in a too often hostile world, a sanctuary from so many hardships. Over the course of centuries, black churches served as “hush harbors” where slaves could worship in safety; praise houses where their free descendants could gather and shout hallelujah -- (applause) -- rest stops for the weary along the Underground Railroad; bunkers for the foot soldiers of the Civil Rights Movement. They have been, and continue to be, community centers where we organize for jobs and justice; places of scholarship and network; places where children are loved and fed and kept out of harm’s way, and told that they are beautiful and smart -- (applause) -- and taught that they matter. (Applause.) That’s what happens in church. The alleged killer could not imagine how the city of Charleston, under the good and wise leadership of Mayor Riley -- (applause) -- how the state of South Carolina, how the United States of America would respond -- not merely with revulsion at his evil act, but with big-hearted generosity and, more importantly, with a thoughtful introspection and self-examination that we so rarely see in public life. According to the Christian tradition, grace is not earned. Grace is not merited. It’s not something we deserve. Rather, grace is the free and benevolent favor of God -- (applause) -- as manifested in the salvation of sinners and the bestowal of blessings. Grace. As a nation, out of this terrible tragedy, God has visited grace upon us, for he has allowed us to see where we’ve been blind. (Applause.) He has given us the chance, where we’ve been lost, to find our best selves. (Applause.) We may not have earned it, this grace, with our rancor and complacency, and short-sightedness and fear of each other -- but we got it all the same. He gave it to us anyway. He’s once more given us grace. But it is up to us now to make the most of it, to receive it with gratitude, and to prove ourselves worthy of this gift. For too long, we were blind to the pain that the Confederate flag stirred in too many of our citizens. (Applause.) It’s true, a flag did not cause these murders. But as people from all walks of life, Republicans and Democrats, now acknowledge -- including Governor Haley, whose recent eloquence on the subject is worthy of praise -- (applause) -- as we all have to acknowledge, the flag has always represented more than just ancestral pride. (Applause.) For many, black and white, that flag was a reminder of systemic oppression and racial subjugation. We see that now. THE PRESIDENT: For too long, we’ve been blind to the unique mayhem that gun violence inflicts upon this nation. (Applause.) Sporadically, our eyes are open: When eight of our brothers and sisters are cut down in a church basement, 12 in a movie theater, 26 in an elementary school. But I hope we also see the 30 precious lives cut short by gun violence in this country every single day; the countless more whose lives are forever changed -- the survivors crippled, the children traumatized and fearful every day as they walk to school, the husband who will never feel his wife’s warm touch, the entire communities whose grief overflows every time they have to watch what happened to them happen to some other place. We don’t earn grace. We're all sinners. We don't deserve it. (Applause.) But God gives it to us anyway. (Applause.) And we choose how to receive it. It's our decision how to honor it. None of us can or should expect a transformation in race relations overnight. Every time something like this happens, somebody says we have to have a conversation about race. We talk a lot about race. There’s no shortcut. And we don’t need more talk. (Applause.) None of us should believe that a handful of gun safety measures will prevent every tragedy. It will not. People of goodwill will continue to debate the merits of various policies, as our democracy requires -- this is a big, raucous place, America is. And there are good people on both sides of these debates. Whatever solutions we find will necessarily be incomplete. But it would be a betrayal of everything Reverend Pinckney stood for, I believe, if we allowed ourselves to slip into a comfortable silence again. (Applause.) Once the eulogies have been delivered, once the TV cameras move on, to go back to business as usual -- that’s what we so often do to avoid uncomfortable truths about the prejudice that still infects our society. (Applause.) To settle for symbolic gestures without following up with the hard work of more lasting change -- that’s how we lose our way again. Reverend Pinckney once said, “Across the South, we have a deep appreciation of history -- we haven’t always had a deep appreciation of each other’s history.” (Applause.) What is true in the South is true for America. Clem understood that justice grows out of recognition of ourselves in each other. That my liberty depends on you being free, too. (Applause.) That history can’t be a sword to justify injustice, or a shield against progress, but must be a manual for how to avoid repeating the mistakes of the past -- how to break the cycle. A roadway toward a better world. He knew that the path of grace involves an open mind -- but, more importantly, an open heart. It's rare to see someone able to marshal themes of tragedy, perseverence, and even a sort of spiritual triumph all at once, but that's exactly what Obama accomplished with this incredibly powerful eulogy.